After decades of visiting the Island, the Ethiopian-born filmmaker Salem Mekuria is setting down deeper roots. When a young Salem Mekuria first visited Martha’s Vineyard in 1973, she was so inspired by the deep roots of the African American population here that she eventually made a film about it. A native of Ethiopia who has since made six more films and a number of award-winning video installations, she remembers well the feeling she had on that first visit to the Vineyard, a trip she made on a whim with friends. Surprise and excitement provoked deeper study of the history of African Americans on the Island, and eventually evolved into the thirty-minute documentary Our Place in the Sun, which was broadcast on WGBH in 1988 and earned Mekuria an Emmy nomination. While conducting research for Our Place in the Sun, she met Dorothy West, the Harlem Renaissance author and seasonal Vineyard resident. “It was a part of African American history I didn’t know much about,” Mekuria said of the Harlem Renaissance. In 1991 As I Remember It: A Portrait of Dorothy West, which she also filmed on the Island, premiered on WGBH and earned her another Emmy nomination. In celebration of the thirtieth anniversary of her first film, the Martha’s Vineyard Museum will host a screening and panel discussion of Our Place in the Sun on August 4 at the Tabernacle in Oak Bluffs. A screening of As I Remember It will take place on August 23 at Union Chapel, also in Oak Bluffs. It will be followed by a question and answer session. 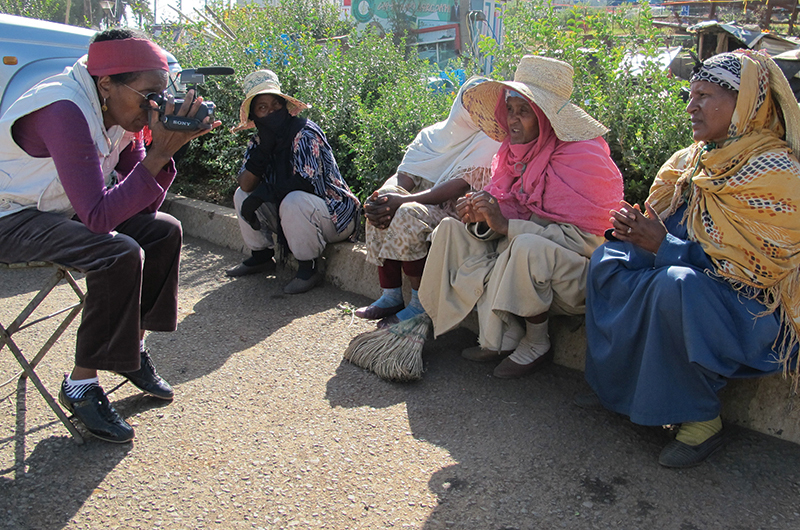 Salem Mekuria, shown here shooting Square Stories Too in 2014, has made several films about her native Ethiopia. For Mekuria, who recently retired from her position as a professor in the art department at Wellesley College and now considers Oak Bluffs her primary residence, the retrospective screenings feel a bit like a coming out party. Though she has visited for decades and made meaningful connections in the artistic community, it has only been in recent years that she’s started to think of the Island as her personal and professional home. Instead, she enrolled in a city university, where she opted to study engineering. At the age of nineteen an international scholarship program brought her to Macalester College in St. Paul, Minnesota, where she eventually transitioned to the study of political science and journalism. The year was 1967. Not only was she forced to adapt to a new country, far from a single familiar face, but with the American civil rights movement reaching a fever pitch, she was thrust into a heated political and cultural debate about which she understood very little. “They were lovely,” Mekuria said of the host family she lived with at first, though she allows that she was oblivious to many of the racial undertones that were likely present in her early encounters as a black student in a predominately white community during increasingly tumultuous times. “They lived in White Bear Lake,” she added with a smile. “Whenever we went out to a restaurant they used to summon the manager and introduce me as their guest from Africa. 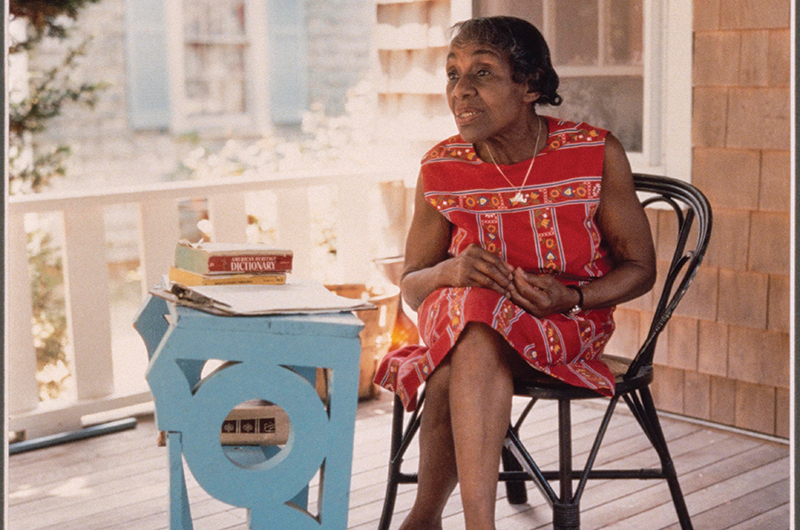 Earlier works by Mekuria explored the experience of members of the Vineyard’s African American community, including the writer Dorothy West, shown at her home in Oak Bluffs. Despite her activism and a degree in political science, like many graduates Mekuria left college feeling confused about her future. She was dividing her time between Oakland, California, where she studied educational media and interned as a television producer, and Ethiopia, where she was following the burgeoning student movement. Then in 1977, a few years after the deposing of Emperor Haile Selassie and the violent political tumult that followed, her younger brother Selomon, who was a part of the movement, disappeared. Mekuria returned home to be with her family and friends and to look for him. “It was another very confusing and complicated time. I tried to do some inquiries about my brother and I was stonewalled everywhere,” she remembered. After her return to the United States in 1979 and the success of her two Oak Bluffs films, this experience would serve as the foundation for what is perhaps her most personal documentary, Deluge, the wrenching story of her brother and a best friend, both casualties of the brutal post-revolutionary military regime. Another film, Sidet, profiles three Ethiopian refugee women in the Sudan. Mekuria’s newest passion and the subject of her latest film is a small intentional community in rural Ethiopia called Awra Amba. Mekuria discovered the five-hundred-person community, which is devoted to the practices of gender inclusion, self-reliance, and environmental consciousness, after meeting its founder during her travels in the country. Last summer, with the help of nine Vineyard friends, she organized a fundraiser at the Martha’s Vineyard Hebrew Center featuring Ethiopian food and music. The event was well attended and raised about $70,000, which will allow the community to install a well and create its own sustainable water system. Modesty and, Mekuria might add, an abiding sense of duty to those who have struggled in the past, both here and around the world. It was this sense of duty and the desire to contribute that shaped Mekuria’s interest in the Island and the prominent black figures and families profiled in her earliest films. The Martha’s Vineyard Museum will present a screening of Our Place in the Sun, followed by a panel discussion, on August 4 at the Tabernacle in Oak Bluffs. As I Remember It will be shown August 23 at Union Chapel in Oak Bluffs, followed by a question and answer session. For more information, visit mvmuseum.org.